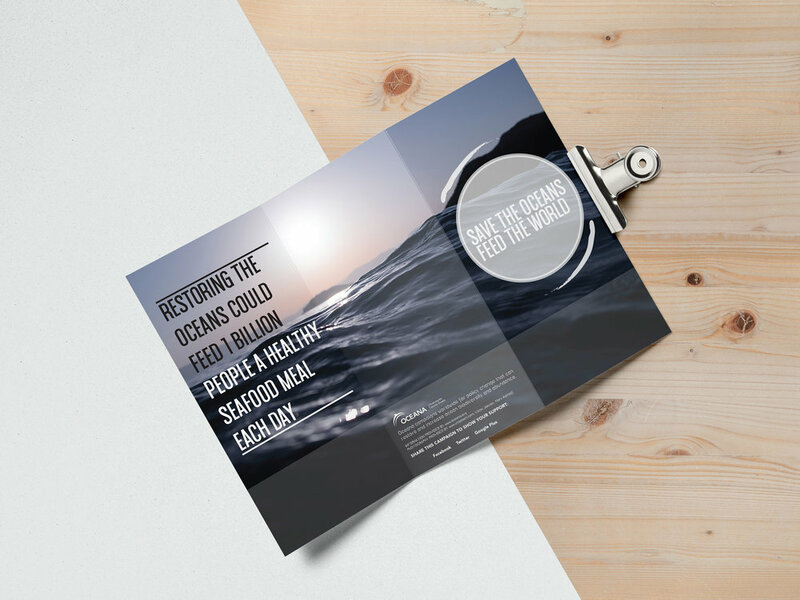 “Save the Oceans, Feed the World” is a promotional campaign brochure for the organization OCEANA. The campaign is focused around saving and cleaning up the oceans, and educating people on how they can help. Wild fish are the most sustainable kind of animal protein, and irresponsible fishing and pollution has reduced many of the oceans population of wild fish, which is problematic. The brochure is designed with sustainability, in mind, and is intended to be printed on recycled paper. It boasts a structured layout which is easy to navigate, keeping the focus on the content. To create a clean, minimal appearance to the ocean rescue approach, a cool toned colour scheme and sans serif typefaces were chosen. An impactful photographic image accompanies simple graphic elements which illustrate the movement of water.